The popular adult movie star Mia Khalifa was busy in social media, twitter. She is well known for her controversies which grabs everyone’s attention. She makes the headlines now and then frequently with her controversial tweets and talk. Now, she is back into the news by tweeting a picture of her as Virgin Mary which made twitterati look at her and started trolling her. 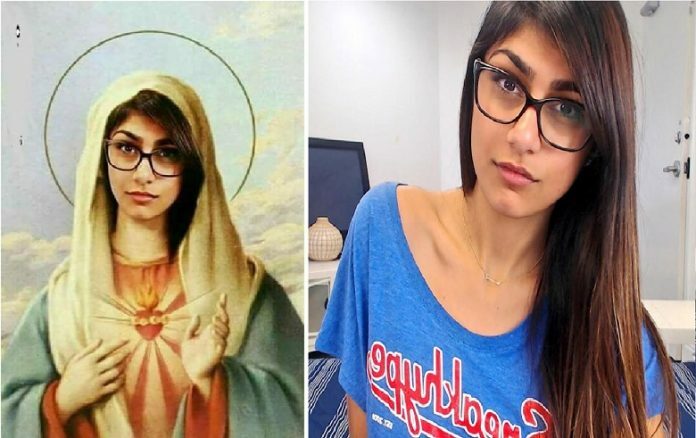 Mia Khalifa’s tweet triggered a controversy. An adult star comparing herself to Mother Mary made Tweeple so furious that they lost it on Twitter and started trolling and slamming Mia. Many were offended calling her a ‘disgrace’ and saying ‘I hope you rot in hell’. Last week she was in the news as the 24-year-old was joking about how some people mistook a photo of Pakistani activist Malala Yousafzai for her last week. The twitterati started trolling her saying. One wrote: ‘Not gonna lie I’m not easily offended but this struck a nerve even if it was a joke I didn’t find it funny. One person with a strange moral stance commented: ‘After this act, I will never look at your videos anymore’. In her caption, the former p0rn star made a reference to Malala Yousafzai, seemingly defending her after she was trolled for wearing jeans. “When a news outlet mistakes Malala for Mia Khalifa,” the caption read. Now, while the caption didn’t spark the controversy, the image Khalifa decided to share along with it did.